In my travels around the Philippines, I have seen various falls in the country and one of things that interests me is the name of the falls. The name "Ambon-Ambon" and "Ulan-Ulan" caught my attention. The name Ambon-Ambon means mild or little shower of rain in Filipino. And being a nature lover, I have explored and seen these falls named "Ambon-Ambon." Here are the various Ambon-Ambon Falls in the Philippines. Only the Ambon-Ambon Falls in Bagac, Bataan remains to be explored and in the near future it will surely be included in my itinerary. See the water falls in the Philippines! Tanauan City boasts of various tourist spots ranging from historical landmarks, lake, falls, public park, parade, and a hill. The last tourist spot is called - Tanawan Hills. Tanawan Hills is a good place to take a respite and escape from the stress of the city living. One can truly enjoy the tranquility and serenity of nature at this place. The interior of the rest house is so cozy and comfortable. and simply marvel looking at Taal Lake. From Manila or Cubao, board a bus (Ceres, DLTB, Starex or Jam) en route to Batangas with the signage - Tanauan/Lipa (never board the "Calabarzon"). Fare is P99.00 only and travel time is 1.5 hours to 2 hours. Alight at the Tanauan City bus terminal station and board a tricycle (P15.00) to the city market. Then, ride another tricycle (P25.00) or jeepney to Barangay Luyos. Travel time is 20-30 minutes from city. In case you are bringing your car, use the SLEX and then the STAR tollway and exit at Tanauan City. It is a lot faster if you are bringing a vehicle. It will take you less than 2 hours to reach the spot. Enjoy the view of Taal Lake and Tagaytay. There are actually three (3) falls in Laurel, Batangas. The most famous is the Ambon-Ambon Falls. The second is the Malagaslas Falls and the third entails more than 2 hours of trekking en route to Tagaytay City. I went to the first two falls but I did not go to the third one due to time constraint. But I will definitely go back and explore the third falls this summer 2014. It was a beautiful Sunday morning of March 2014 when I decided to go to Laurel. I woke up around 6 am and my first instinct was to look at the sky and see for myself whether it was cloudy or not that day and much to my surprise, it was a clear blue sky! And I took my breakfast, fixed myself and immediately boarded my bike and sped off towards the municipality of Laurel. From Manila or Cubao, board a bus (either DLTB, Jam, Starex, or Ceres) en route to Batangas City. Never board a bus with the signage "Calabarzon" instead the bus that you have to take should be having the signage "Tanauan City/Lipa." The trip is good for 1.5 to 2 hours only. Fare is P99.00 only. Alight at Tanauan City bus terminal and board a tricycle to the city market. Fare is P15.00-20.00 only. Reaching the market, go to the jeep terminal of Laurel (or Talisay but you have to take another jeepney from Talisay). Travel time is more or less 1.5 hours from Tanauan City to Laurel. Fare is P45.00. Then, alight at Total gas station in Laurel or in the market itself and hire a tricycle for P75.00 only to Sitio Salipit (jump-off point towards the falls). My guide that day was Edwin (0949-609-1196) and I paid P300.00 for the tour. The exact address of the falls is Sitio Salipit, Barangay San Gabriel, Laurel, Batangas. 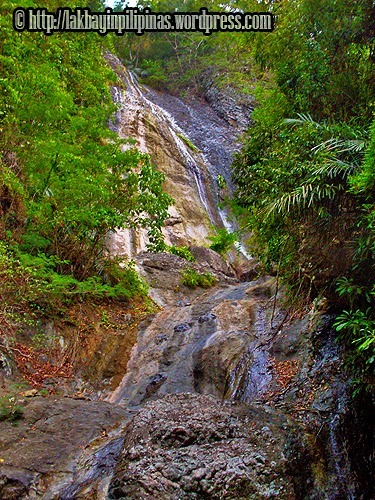 From the jump-off point, it will take you 20-25 minutes before you reach Ambon-Ambon Falls. The trek is quite easy and you can enjoy the scenery while walking towards the falls. You have to cross the river for three times before you reach your destination. The best time to go to the falls is between the months of January to May. And there are plenty of local tourists going to the falls and you have to go there early in the morning. 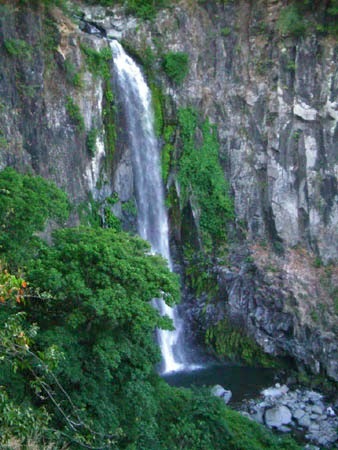 After ten minutes of walking, you will reach the first falls called - Malagaslas Falls. You can rent cottages (P300) and tables (P100) while you are here. There also videoke, food and other amenities offered in this site. And you will cross the river for the third time and this one will surely make you wet since the trail goes directly through the water and there is no other alternative. But the river crossing is going to be fun! And finally, you've reached Ambon-Ambon Falls of Laurel! It is approximately 60 meters high and the sight will surely make your jaw drop. The falls is two-tiered and you will surely be awed once you see the majestic falls! In case you want to spend the night at Laurel, the best choice is Hacienda Cascada. You can experience their adventure camp at Pugad Lawin. Last March 8, 2014, the city government of Tanauan City launched its first ever activity dubbed as - "Parade of Lights". Under the auspices of its incumbent Mayor Tony C. Halili, the parade was participated by several business establishments operating in the City. The promotion of Tourism is the primordial reason why the activity was held in line with the tagline of the city as the "City of Colors!" The parade started around 6:15 pm after the sunset and everybody was enthusiastic and excited to see the parade culminate into a reality. The parade was divided into three categories, namely: street dancers, most colorful and brightest float and the biggest number of supporters for the event. The parade started from Soledad Subdivision in Barangay Darasa, Tanauan City, Batangas where a multitude of people gathered to witness the event. And the parade was witnessed around the city. The parade lasted for more than two hours. One of the brightest was the CP Reyes Hospital's float. After the parade, the winners were announced. And a concert was staged at the Old Municipal Hall as part of the Cityhood of Tanauan City's yearly activity. Hopefully, this will be the start of the annual parade of lights in Tanauan City.